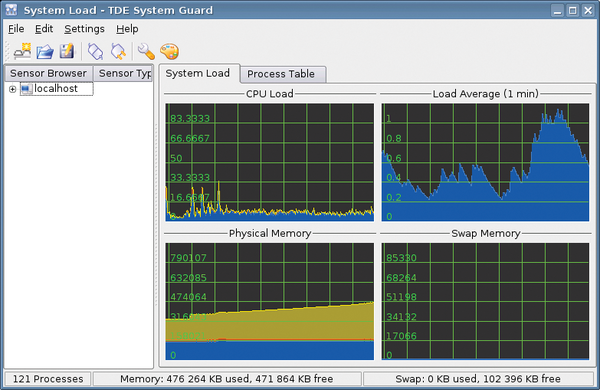 The desktop profiler is one example of a feature unique to Q4OS. The profiler can be activated using a button of the same name, which is found in the Software Centre. The resulting dialog houses three predefined software profiles, each of which offers a particular selection of programs that can be applied to various purposes. Putting the desired software on the SD card of the Raspberry Pi involves selecting a profile followed by a mouse click on the Install button. However, as mentioned earlier, the SSE command sets of newer Intel processors are required by some of the programs in the first profile named Full featured Desktop. As a result, selecting one of these profiles leads to an error message and the installation process is terminated (Figure 5). Figure 5: It is not possible to install applications that are dependent on the specialized capabilities of Intel hardware. Testing showed that Q4OS running with a typical work load barely utilized all of the capabilities of the Rasp Pi 2 Model B. When compared with standard-sized computers, nothing especially remarkable appears in the status monitor (Figure 6). Office applications merely make average use of the CPU. The change in working memory usage is relatively minor, alternating between about 350 to 500MB, even when several programs are open. Most of the time, the command-line tool htop also shows an average-sized workload for the hardware. Figure 6: Q4OS does not tax the capabilities of the Raspberry Pi. To take a more precise look at the processing capabilities, I installed the strategy game Widelands on the Raspberry Pi. This large game is an extremely load-intensive application that tests the Rasp Pi graphics cards. To generate increased processor loads, I also had Audacity run conversions of large audio files from MP3 into Ogg Vorbis format. The hardware of the Raspberry Pi reached its limits in both cases. Because of jumpy graphics, it became impossible to play Widelands fluidly, even with small landscapes. The audio file conversions required significantly more time than they normally would have on the new Intel Core processors. However, Audacity actually used up the capacity of only one of the processor cores of the Raspberry Pi Broadcom CPU. Thus, the system is not suitable for CPU- or graphics-intensive applications on the desktop. Several operating systems are designed to run on the Raspberry Pi. We look at some leading alternatives. The NOOBS boot manager helps beginners try out Raspberry Pi operating systems. It also lets advanced users dig into the structure of the systems and adapt them as they like. NOOBS (New Out Of the Box Software) version 1.4.0, provides beginners an easy way to install operating systems on their Rasp Pis. The new Rasp Pi display provides a compact option for viewing screen output – and it comes at a Pi-like low price of only $60.